Want a strong and healthy pup? You can have your very own canine Popeye if you feed him spinach. This nutrient-dense green contains twice as much iron than many other greens. This leafy green vegetable is also a good source of fiber, calcium, potassium, and vitamins A, B6 and K. Spinach is particularly good for dogs who need to ward off inflammatory and cardiovascular problems as well as cancer. The flavonoids and carotenoids contained in spinach work as anti-inflammatory and anti-cancer forces. Nutritious and low in calories, green beans are a good choice that will load dogs up with iron and vitamins. You will receive a 1 lb. resealable bag of Green Bean Spinach Bone treats. The treats are approximately 2" long. 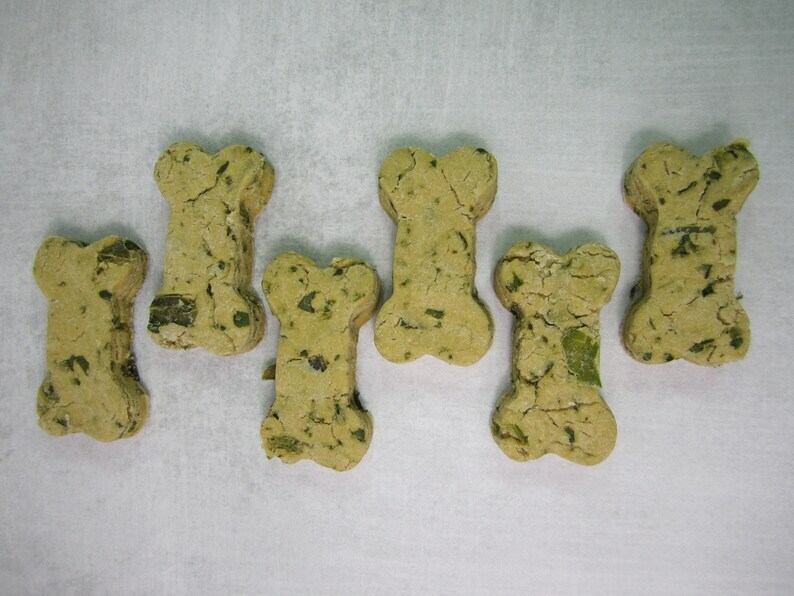 These Green Bean Spinach bones are made with chickpea flour so they are wheat free.